Beehives are bustling communities. In the summertime, a typical hive can be home to tens of thousands of bees. Every honey bee in the hive has a specific job to do to ensure that the hive survives. How do they keep this well-oiled machine running as it should? The answer: they are excellent communicators! Honey bees have two primary ways that they communicate with each other: motion and odor. They use these methods to get things done. Protecting the hive, sharing the location of food and other resources and completing daily tasks are all organized through these effective communication methods. Let’s learn more about the captivating ways honey bees communicate and how their techniques help them survive and thrive. As social creatures, honey bees need exceptional communication methods to keep the colony safe and operational. 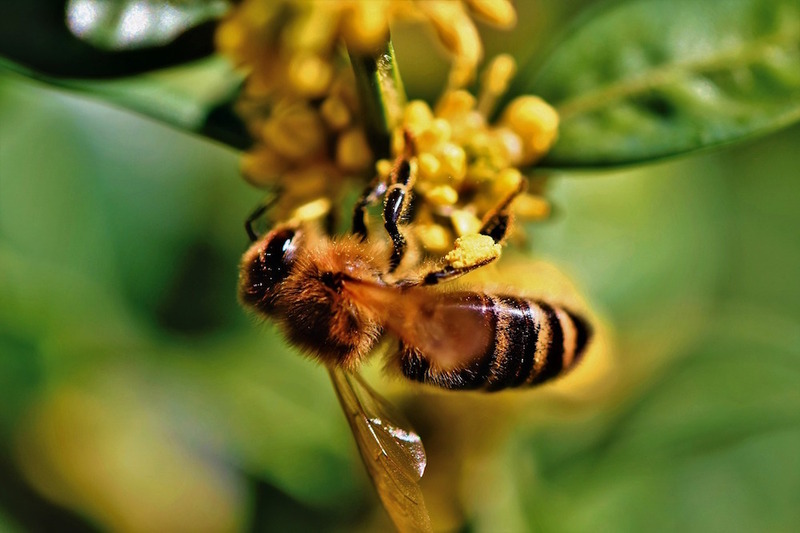 One of the primary ways honey bees “talk” is through odor, or pheromones. The other method is through motion, or the waggle dance. You might be wondering, “What is a pheromone exactly?” Pheromones are chemical “odors” that produce a specific response in members of the same species. In honey bees, pheromones are responsible for communicating some of the most important activities in and around the hive. The queen will release pheromones to manage reproduction in the hive. She will emit a specific pheromone that discourages the female worker bees from mating. The queen will emit another pheromone that will make all the male drones very attracted to her. These actions allow her to control the members of the hive, helping her reproduce and keep the hive thriving. Pheromones also aid in keeping the hive safe from outside threats. If a worker bee encounters danger and stings, she will automatically release a specific pheromone that acts as an alert to the other bees in the hive. These important chemicals are also thought to be involved in other bee activities including egg laying, nursing newborn bees, swarming and direction taking. Perhaps the most notorious way that honey bees communicate is through a motion known as the waggle dance. The unique movements they make are key techniques for telling other honey bees the locations of food, water or new nest sites. When the trusty scout bees find delicious pollen, nectar or water, they race back to the hive to share the good news with the other worker bees. Then, they begin to dance. The way they dance indicates to the other bees the direction and distance of the newly found food or water source. For example, if the location is relatively close (usually less than 50 meters), the bees will perform a round dance. At greater distances, the honey bee dance begins to take on a figure-eight formation, also known as the waggle dance. To communicate direction, the honey bee will align her body in the direction of the source, using the sun as a guide. Amazing! Do You Have a Buzzing Bee Hive on Your Property? As you can see, honey bees have a very unique but effective way to communicate with each other. Their use of motion and pheromones allows them to manage the hectic bee hive lifestyle. If you have a beehive on your property, be sure to call a professional live bee removal expert to carefully handle the issue. Bees are delicate and need to be protected more than ever before. Don’t risk harming them, or having them return, by removing honey bees on your own. Call D-Tek Live Bee Removal for a free quote and to learn more about these amazing creatures!